Charges for surfing the internet on smartphones while travelling in the EU have been cut by half as new rules come into force. European leaders have brought in changes over recent years to cut the fees in stages since 2007, aiming to eliminate them entirely within months. 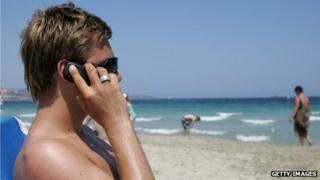 These roaming charges can lead to phone users getting a "bill shock" following overseas trips. The latest changes are designed to coincide with the holiday season. "This huge drop in data roaming prices will make a big difference to all of us this summer," said Neelie Kroes, the EU telecoms commissioner. The changes mean that price caps for data downloads have been cut from 45 euro cents (36p) per megabyte, before VAT, to 20 cents (16p). Fees for calls and text messages should also be reduced as the new rules come into effect on Tuesday. The cap for making a call falls from 24 cents per minute to 19 cents, and sending a text (excluding picture texts) is down from eight cents to six cents. Meanwhile, the cap for receiving calls is down from seven cents a minute to five cents. Stuart Miles, founder of the Pocket Lint website, said that consumers should feel the benefit of the changes, although phone companies could alter the structure of some of their deals. He said that many operators already had infrastructure across different European countries so these additional charges were questionable. Consumer groups have warned that consumers need to still be on their guard against bill shocks if travelling outside of the EU. European politicians want to go further and make the cost of a call or downloading internet data in another EU country the same as it would be at home. In April, the European Parliament voted to scrap roaming fees, but this now requires the approval of all EU governments.